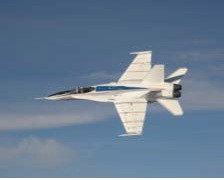 ARTS IV is the fourth generation ARTS and was engineered for NASA DFRC’s F/A-18 #853 aircraft. The aircraft, recently dubbed the Full-scale Advanced Systems Testbed (FAST), is currently being flown in support of NASA’s Integrated Resilient Aircraft Controls (IRAC) project. The IRAC project will benefit aviation safety by creating technology that could help damaged aircraft to fly and land safely. Two flight units synchronized via an RS-422 cross-channel data link are installed on the FAST aircraft. The synchronized units provide a dual-redundant research flight computer system to host advanced research. The units are integrated with the FAST main flight computer via a quad-redundant 1553 bus. When the ARTS IV is engaged, the main flight computers allow it to have direct command authority over all of FAST’s control surfaces. The third flight unit serves as a spare. The ARTS IV application software reused concepts, architecture, and common subsystems from ARTS II and III. All safety-critical ARTS software is certified to NASA-STD-8719.13B, which is NASA’s standard for safety-critical software. A single ARTS IV flight unit featured a ½ ATR flight chassis with three single board computers, and a wealth of external I/O including 1553B, Ethernet, RS-422, discrete, and analog. Additionally, each unit has 48 GB of on-board data storage capacity. The ARTS IV flight units are environmentally certified to MIL-STD-810F (vibration, shock, and thermal) and MIL-STD-461E (EMI).